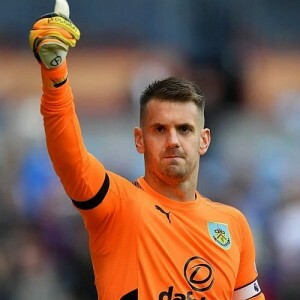 Tom Heaton lined up in goal for Burnley today for the first time since sustaining his shoulder injury against Crystal Palace last September, and he was joined by Dean Marney and Chris Wood in a behind closed doors game against Blackpool at Gawthorpe. Tom didn’t make the best of starts. He conceded a penalty in the first minute of the game from which Blackpool, who included Burnley’s Dan Agyei in their line up, took the lead but the game ended 1-1 with a trialist scoring a late equaliser for the Clarets. Heaton and Marney both played the entire game whilst Wood was replaced by Tunde Bayode after seventy minutes in a team that also included Stephen Ward, Georges-Kévin NKoudou and Nahki Wells. The Burnley team was: Tom Heaton, James Clarke, Aiden O’Neill, Oliver Younger, Stephen Ward, Dwight McNeil, Trialist, Dean Marney, Georges-Kévin NKoudou, Chris Wood (Tunde Bayode 70), Nahki Wells.